Since 1869, before the Columbian Exposition and the foundation of the University of Chicago, Saint Thomas the Apostle Parish has been adding to the rich diversity of Hyde Park. As a congregation we are heirs to magnificent devotional artwork including the bronze bas relief Stations of the Cross and Pietà in art moderne by Alfeo Faggi and original stained glass windows designed by Valentine d’Ogries. Our present church was designed by the renowned architect Francis Barry Byrne. 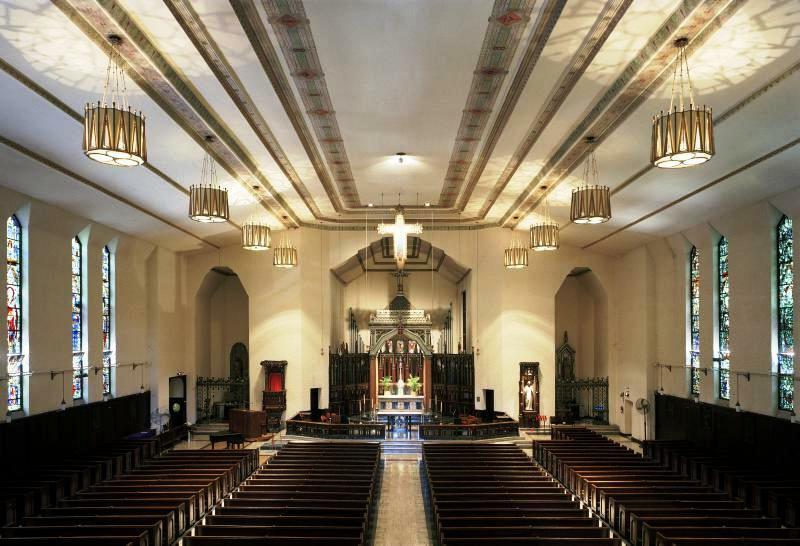 Completed in 1924, Saint Thomas the Apostle’s current house of worship features a non-cruciform floor plan, 25 ft. high stained glass windows and a ceiling that spans more than 125 feet with no interior pillars or visible supports. It has been called the first modern American church as it does not repeat European (Italian or German) designs as was common in Catholic churches built in that era. The exterior façade is adorned with terra cotta by Alfonso Iannelli with finials by Edgar Miller. Our church and convent were listed on the National Register of Historic Buildings in 1978. Many of our original works of devotional art are catalogued in the Smithsonian Institution. From the statue of St. Thomas in front of our main West doors to our magnificent oil paintings by William E. Schumacher hanging in the rear of the nave, to Milton Horn’s, “Jacob’s Struggle” in the Baptistery, we invite you to learn about the building and sacred space during one of our guided architectural tours. Free tours are offered by appointment. Brochures describing the art are located at the welcome table in the narthex. Our fourteen Stations of the Cross and the monumental Pietà were created by sculptor Alfeo Faggi (1885 – 1966) and commissioned by Mrs. Frank R. Lillie. They are widely considered to be among Faggi’s greatest works. The Stations are done in bronze and are low bas-relief with bold, elongated forms and minimal details. The Pietà is a thematic representation of the thirteenth Station in which the Mother of God is realized 3-dimentionally while the figure of the collapsed Christ is flattened against her, as if to highlight that the mother and child both share the one flesh and share a common suffering. St. Thomas the Apostle is fortunate to possess the largest known collection of original stained glass windows by Valentine d’Ogries, there are 28 in our church, with additional windows in the convent and rectory buildings. D’Ogries was commissioned in 1923 and the windows were created and installed into the 1930’s. He did not blow his own glass but imported very high quality glass from Europe. He bought different colors from different makers for “variety in depth and intensity.” Details were painted on the glass with metal oxides and then fused in fire at 1000 degrees. Eastern (Greek, Syriac and Arab) teachers and doctors of the Church are found on the West windows. Western (Latin) teachers are depicted in the Eastern windows.